“Where should we eat?” For the second year in a row, we’re helping you answer that age-old question with the return of our Top 100 Places to Eat in Canada list. Just like last year, our data scientists compiled the top 100, ranking businesses by looking at their rating and the volume of reviews, only considering the reviews written by Canadian users. New for this year, we’ve focused more on more recent reviews to help you find your next meal. The results of our data science team’s meeting of the minds is a list that combine classics like George and Kingyo and up and coming favorites like this year’s number 1 pick Muncheez. The list also shows that Toronto is one of Canada’s top foodie destinations with more than 40 of the top 100 eateries — more than any other city. You’re going to want to make a note of these spots, so we made it easy for you. With our new bookmark collections feature, you can see the whole list in one place and follow it! To do so, open Top 100 Places to Eat 2017 – Canada on mobile (make sure to have the Yelp app downloaded!) and hit ‘follow’ once you’ve opened it in the app. Now you’ll always have the top 100 with you. Did one of your favorites not make the list? Share your thoughts on the list on social media using #YelpTop100 and tell us what you think. Don’t forget to check out our picks for the top places to eat in the United States! 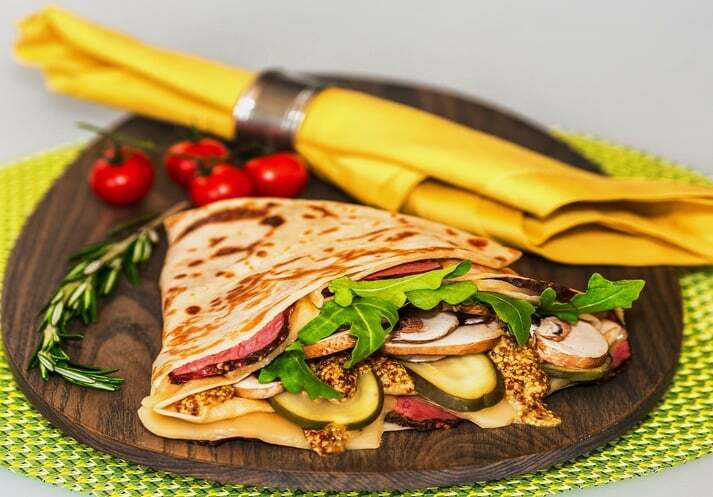 A New York’s Own crepe from #1 Muncheez, by Kelly M.
To determine Yelp’s Top 100 Places to Eat in Canada for 2017, we looked at the reviews received by businesses in the restaurant and food truck categories, focusing more on more recent reviews. We considered both the rating and the volume of the reviews, although the weight given to the sheer number of reviews is distinctly lighter than it was last year. To localize the list, we only considered the reviews written by the users from Canada. Businesses must be primarily a restaurant or place to eat a meal to be included on the list. If a business with multiple locations appears more than once on the list, we keep the highest ranked location and mentions the others in a footnote.